G4ILO's Blog: Should I or shouldn't I? I have found a pre built version on Ebay if you don't feel like/can assemble it yourself. 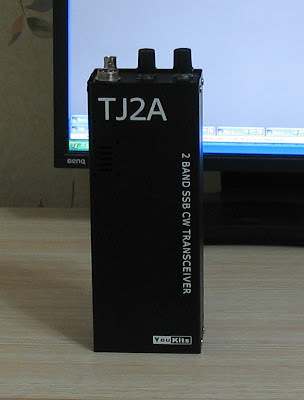 Julian, one of the things that prevents me from buying it is that, although it's a dual mode (CW & SSB) rig, its freq coverage essentially makes it a single mode rig. You have to choose whether you want the VFO to cover the CW *or* the phone portion of the bands - it won't do both without realignment. I think you can opt to have one full band in two segments. It's an issue of the limited VXO range and only having two XOs available. Yes, that's what the manual states, that you can cover an entire band (non-WARC) in two ranges. So, it's dual mode in one band. Not sure if you can cover both the CW portion of one band and SSB portion of another? The built version Henrik found will cover the CW end of 40m and the SSB end of 20m unless you specify otherwise, if you check that eBay listing. So it would seem to be possible. My advice is, don't buy it. The rig is under development and YouKits is doing so by asking for F/B. You are going to evaluate the kit and you will pay for it!!! Like I did with the K3, you mean? You can't compare the TJ2A with K3. As for K3 it was a matter of new firmware. If someone is advertize his products/Kits and his cooperations, in radio magazines all over the place, he must be able to support his kits on his own. I am not going to sent him my FB not to buy the kit at the first place! There is already one for sale on my Flea Market. Advert offers swap for FT817... Must be a hopeful seller! Its worth a go, I don't have the cash at the moment, but when I do that is a must. Having just recovered from a similar, but nowhere near as serious a condition as yourself, I found the bitx great therapy! There are 5 crystals in this package, covering below frequencies. There are 7 crystals in this package, covering below frequencies. "There is also a mod already to stop BFO leakthrough into the IF stages." "And there doesn't appear to be any high SWR protection for the PA so using the rig with handheld antennas - or any type of antenna that presents a mismatch prior to tune-up - might be problematic." I was thinking a Hendricks SLT+ built-in the compartment for the battery pack and use precut End-Fed Half Wave wire antennas. Maybe an Emtech ZM-2 built-in "ugly construction" style? I would like to know what are the inside dimensions of the battery compartment?